Learning Stars are a community group of people with learning disabilities based in West Lancashire. In partnership with Workers’ Education Association we have activity/education workshops 4 days per week in various venues. These workshops are Art, Choir, Gardening, Drama and Dance as well a drop-in centre. Our theme for all workshops during 2017-18 has been remembering World War One. 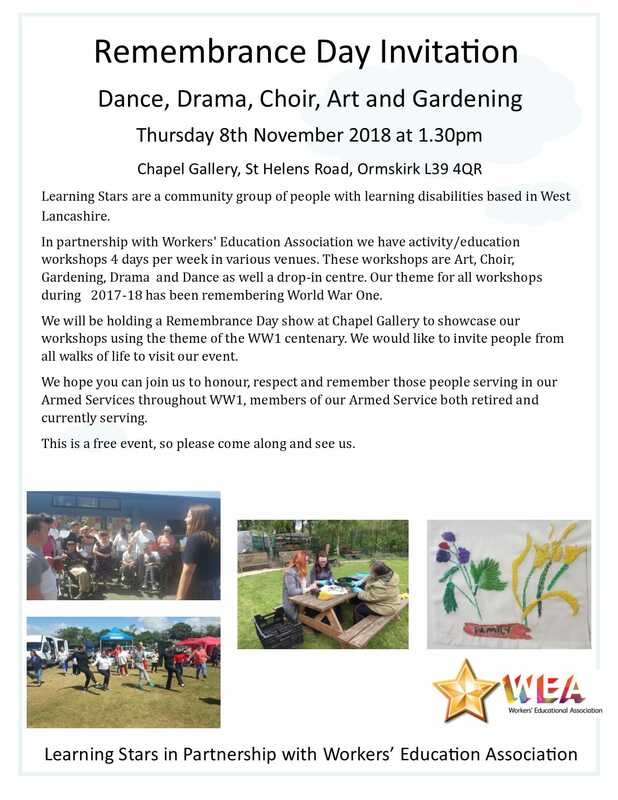 We will be holding a Remembrance Day show at Chapel Gallery to showcase our workshops using the theme of the WWl centenary. We would like to invite people from all walks of life to visit our event. We hope you can join us to honour respect and remember those people serving in our Armed Services throughout WWl, members of our Armed Service both retired and currently serving. This is a free event, so please come along and see us.